The footy World Cup is over and we want to look back on the publishers’ perspective just as we did in Germany and in Switzerland. For this analysis we choose to focus our interest on UK`s currently most famous player Mohamed Salah, who participated as part of the Egyptian national team, the quarter finals and UK’s world cup matches. Theguardian.com and bbc.co.uk leave the quarter finals victoriously. Let’s start with the Desktop News Boxes for ten days. Here we look at the top 5 publishers for the quarter finals. Next to our general interest publishers we have cbssports.com not only from overseas, but also in the sports category. Overall we see theguardian.com on top on most days with over 20 percent and only a slight drop on the fourth of July. Suprisingly is that the day when cbssports.com gains a lot of visibility with 15.56 percent. They gain the most ranks on that day with the France/Uruguay match. The skyrocketer of the period is obviously bbc.co.uk. They start with only 1.82 percent and only eight News Box ranks on the 2nd, but gain up to 38.06 percent on the 8th and the most ranks for the Sweden/England match. Another publisher with an impressive jump is independent.co.uk with scores beneath 5 percent before the ninth, while they gain visibility for the Russia/Croatia match on the last three days. The fifth place in the top spots is taken by telegraph.co.uk. The big publishers are highly competitive during the UK matches. While the quarter finals have been interesting, the public in the UK had their eyes on the England matches. What would be better to look at than the mobile Publisher Carousels that have been gaining a lot of visbility especially for sports events. 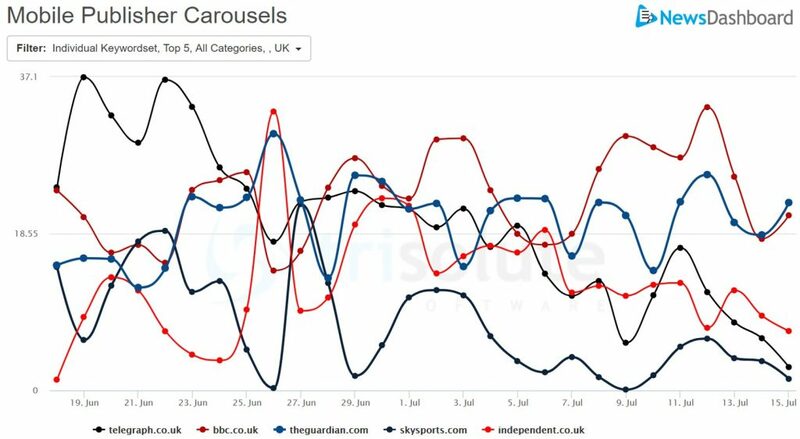 While clearly telegraph.co.uk takes the lead in the beginning with scores highly above 20 percent until the 26th of June, afterwards the field becomes less predictable. Independent.co.uk scores with its most visible carousels and 32.99 percent on 26th of June with amongst other topics Danny Murphy. Another high scoring publisher is bbc.co.uk especially during the later days of the world cup. Skysports.com as a special interest publisher and theguardian.com complete the field. Liverpoolecho.co.uk scores for its own player. In the visibile part of the mobile News Box we see a whole other publisher on top for “Mohamed Salah” during Egypt’s participation in the world cup. Unsurprisingly, it is a publisher from his regular teams’ town liverpoolecho.co.uk. On their best day they score 68.97 percent and 254 News Box ranks with only 5 articles. While bbc.co.uk doesn’t score high constantly, they have several great scores in-between. Another publisher with two peaks is dailystar.co.uk. on the 17th and 21st. Skysports.com is also scoring great all around, but starts off with their best score on the 15th of June with articles around Mohamed’s former injuries. Theguardian.com on the other hand scores at the end with up to 63 ranks a day with only one article. Last but not least we have express.co.uk with scores between 0 and 22.08 percent. Overall general interest publishers scored better for the world cup than special sports publishers. Only bbc.co.uk scored for all keyword clusters we analysed; which shows that the overall field was highly competitive.